Boys navy premium quality 100% wool tall top hat, a timeless traditional style for the young gentleman, perfect for those formal occasions at a wedding or special event. 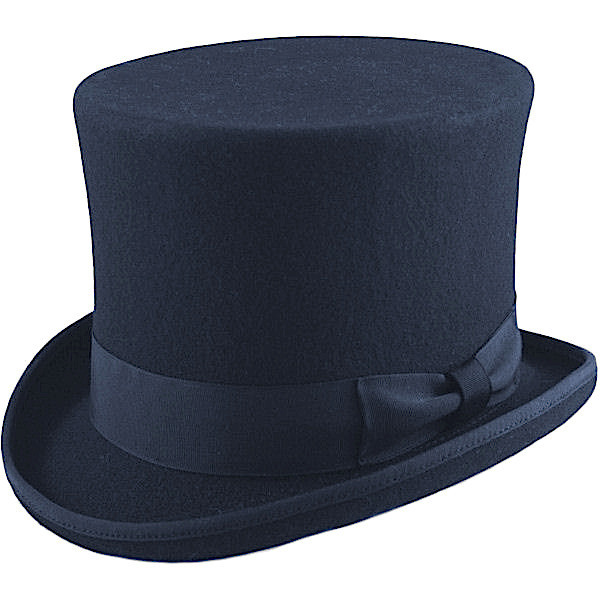 This navy top hat is made using the finest wool, lined with satin for superior comfort. Flat at the top, curved around all of its sides, yet straight in the centre. A luxury ribbon band fitted to the outside of the top hat with a side bow. This is a very sturdy top hat to ensure a secure fit, one of the best quality top hats found in England UK. Fully tagged with packaging presented in a box for a safe and secure delivery. Optional Extra: you can also purchase a Top Hat Box Bag, a professional sturdy carry case with adjustable handle for storing your top hat in. Measurements - we strongly recommend you measure the boys head circumference and compare with the measurements below to ensure a perfect fit. Suitable for boys from infant through to teenager / young man. Small 56cm / 22" 15cm / 6"